The only time in year that brings equal joy, happiness and celebration in everyone’s life is Diwali. Diwali the festival of lights and also called as the great historical day to celebrate the triumph of good over evil is the biggest celebration in India. And particularly not only in India in other countries across the world as well, where Indian community is settled, they all celebrate the mirth and merriment of the day with their near and dear ones. The carnival of Diwali is the best time of the year when every one gets indulged in shopping, gifting, cleaning to celebrate each and every moment of the day. There are many mythological views for celebrating Diwali. Many religions in India have their own belief to celebrate the day but the best and the most popular story is the return of lord Rama to Ayodhya after 14 years of exile. It is said and believed that when he returned to his home in Ayodhya along with wife Sita and brother Laxman, villagers illuminated his path, there was firework and sweets were spread everywhere in celebration of his comeback and that celebration is carried forwarded for years in India and is in existence today as well. Another great reason behind the celebration of Diwali is that, people belief that goddess Laxmi came out from churning of sea (Samundra Manthan) on this day that is why people worship the deity of prosperity on the holy celebration of Diwali. People rejoice the day together and observe the best of the five day long carnival by exchanging gifts and sweets to their loved ones across the globe. This day is also observed as a great gift exchange carnival in the world and it is because, it is the best way to come closer to each other. Gifts are nothing but a token of exchange of love. Whether elder of the family or owner of company every elder or responsible person is filled with the obligation to distribute gifts and sweets to others in their radium. Few things that turns out to be great Diwali gift hampers include silver coins, auspicious idols, delectable sweets and chocolates, impressive apparels, unique accessories, assorted dry fruits and special decorative Diwali puja thali. If you too are planning to gift your loved ones something very special and that too in a hassle free manner on Diwali, then we highly recommend you to opt online gifting services for that. Online gifts are not only easy to approach but they make a great choice for the day as well. Buying and sending Diwali gift hampers online means you are picking the best gift with thousands of gifting ideas available online, plus you can also enjoy the free shipping benefit available with that. 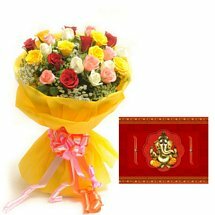 Send Diwali gift hampers online to India for those who are incredible part of your life. Sweets Hampers: Without sweets every festival and special occasion is incomplete in India. Sweets hampers are comprises of mouthwatering sweets like Rasgulla, Gulab Jamun, Rajbhog, Rasbhari, Kaju Katli, Kaju roll, Besan Laddu, Soan Papdi, Soan cake and much more. If someone is sweet tooth then nothing can be the best to gift him/her than sweets hampers. So, buy and send sweets hampers to India online for your loved ones. Chocolate Hampers: Chocolates are the new trendy sweets that people also share with loved ones on festive occasions. Considering this we have brought delectable pack and basket of chocolate hampers. These packs are full of chocolates from renowned companies like Cadbury Diary Milk, Kitkat, Gems, Ferrero Rocher, etc. A hampers comprising of all these delectable chocolates will be the best surprise for your elders and little ones too. 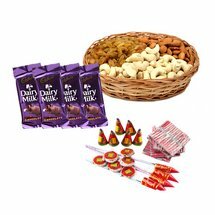 Buy and send chocolate hampers to India online as Diwali gifts for your loved ones. Dryfruits Hampers: This nutritious and healthy gift hampers will be loved by your relatives and will also show the good intension of yours for the recipient. This hampers consists of assorted dryfruits like pistachios, cashew nuts, walnuts, raisins, almonds etc. Pick any of these hampers to delight your friends and relatives and make the day special for them. Diwali gifts hampers are mostly favored in corporate sectors. 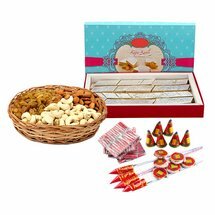 So if you want to delight and send best wishes to a distant client or your colleague on auspicious occasion of Diwali then you can buy and send Diwali gifts hampers to India online for them and give a wonderful surprise to them. Diwali gifts hampers are comprises of designer diyas, Laxmi Ganesha figurines, assorted dryfruits, sweets, flowers, cards, silver plated Pooja thali, gold plated Pooja thali, showpieces, idols, candles and much more. Go through our designs catalogue display on our site and pick the best one that accomplishes your desires. 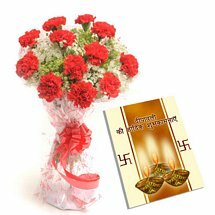 Buy and send Diwali gifts to India online to convey your best wishes on this very auspicious occasion of Deepawali and make the day even more special for them.